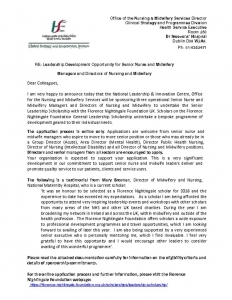 The National Leadership and Innovation Centre, Office for the Nursing and Midwifery Services (ONMSD) is delighted to work in partnership with the Florence Nightingale Foundation UK to support three senior leadership scholarship places (2018-2019) for Senior Nurses and Midwives and Directors of Nursing and Midwifery in all sectors working in operational posts in the HSE and voluntary sector. Leadership is recognised as crucial for successful reform and change in the health service and is central to sustaining a positive culture together with the underlying values of care, compassion and commitment. This scholarship offers participants a unique learning opportunity to come together with others to network with peers and leaders from across an international leadership perspective. The closing date is 14th September 2018. 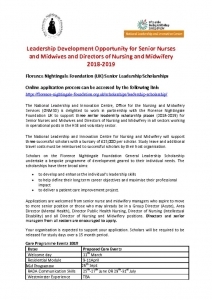 Please read attached documents and follow the application online through the following link https://florence-nightingale-foundation.org.uk/scholarships/leadership-scholarship/ or access the Florence Nightingale Foundation through Google and see Scholarships (Senior Leader Scholarships).